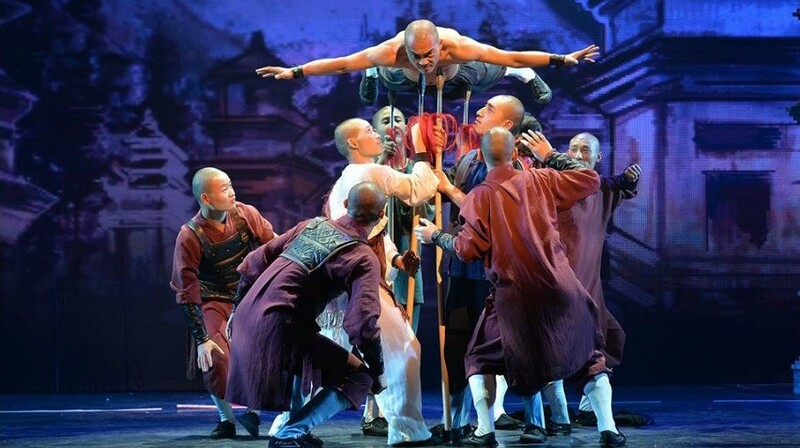 The Shaolin Warriors will visit Bend's Tower Theatre on February 7. Mount Song sits 4,961 feet above sea level in central China’s Henan Province. Nestled among its peaks sits the Shaolin Monastery, a 1,500-year-old institution of meditation and martial arts. Resorts are popping up in the foothills surrounding the temple, and Shaolin is becoming one of the world’s best known monasteries, bringing in an average of 6,000 tourists a day. In 2007, Russian President and martial arts enthusiast Vladimir Putin became the first global leader to visit the monastery. Despite some conflict over how to regulate religious practices in the temple, the monastery is spending more and more time in the public eye. However, you don’t have to board a plane to China to witness the intense, ancient practices of the Shaolin monks. Since 1999, a small group of Shaolin monks have been touring the world, showing off their jaw-dropping dedication and athleticism. Their shows tell the stories of the monastery’s early history, highlight some of the key principles of Chan Buddhism and bring their unique brand of kung fu to the masses. Many of the Shaolin Warriors performances seem to break the limits of human strength and pain tolerance while others demonstrate movements done in mesmerizing unity. One of the most impressive stunts features the breaking of bricks on a man laying on a bed of nails. The Shaolin Warriors show will return to Bend on February 17, offering a glimpse into an ancient world. The monks haven’t visited Bend since 2012, so fans of martial arts and adrenaline junkies alike should grab tickets while they still can. The Survivorman comes to Bend for a nature-inspired concert. Marco Benenvento will be at The Capitol on April 11.